We New Star use real human hair as raw material to make these #613 bundles, each bundle feels very silky and soft, minimal shedding and tangling are guaranteed. 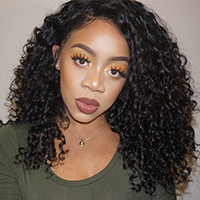 We are a professional team, having been in hair area more than ten years, our goal is to ensure every hair bundle to have enough weight, which is about 100g, we also provide every client with first-class pre-sale and after-sale service. Full refund and return policy are also our big advantage. About this #613 blonde bundles with closure, you can dye them to any color you want, they will give you an amazing hair color. The closure matching these blonde 613 bundles uses Swiss lace, which has a perfect breathability, and the medium brown lace will bring you a perfectly natural hairline.